World-ranked welterweight Freddy “El Riel’’ Hernandez is one step closer to a future world title shot against Andre Berto following his convincing fourth-round TKO victory over Mike Anchondo on ShoBox: The New Generation on ShowtimeFriday night from Buffalo Bills Casino. 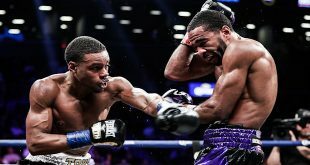 A poised and relaxed Hernandez controlled the entire scheduled 10-round welterweight fight, registering an early fourth round-knockout with a “cannonball blast,” right hand shot according to Showtime expert analyst Steve Farhood that all but ended the fight. “This was a sales job for Hernandez,” Farhood added later. “He’ll probably be in line for a title shot with Berto next." 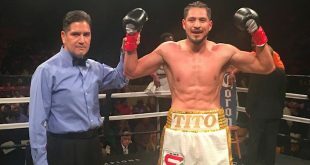 The former world champion Anchondo of La Puente, Calif. falls to 30-3 (19 KOs ). In the co-feature, 2004 Cuban Olympian Luis Franco (7-0, 5 KOs) of Miami, Fla., registered a unanimous decision against Wilton “Pretty Warrior’’ Hilario (12-2-1, 9 KOs), of Saint Louis Park, Minn., by way of Santa Domingo, Dominican Republic, in an eight-round super featherweight bout. It was scored 80-71, 78-73 and 77-74. It was the first time Franco went past the fifth round as a professional. It wasn’t pretty, but Franco got the job done against a game and offensive Hilario who Menefee at one point described the pesky fighter, “like a bug in the summertime. He just keeps following you. During the telecast, Farhood commented on an exciting announcement of a two-round, single-elimination tournament on Showtime to determine the best fighter at 118 pounds on Dec. 11. The fighters are IBF 118-pound champion Yonnhy “El Colombiano” Perez, undefeated, world-ranked rising star Abner Mares, former IBF bantamweight champion Joseph “King Kong’’ Agbeko, and two-division world champion Vic “Raging Bull” Darchinyan. The tournament will begin with two semifinal bouts live on Showtime at 9 p.m. ET/PT (delayed on the west coast) from Leon , Mexico . Each bout will be scheduled for 12 rounds. 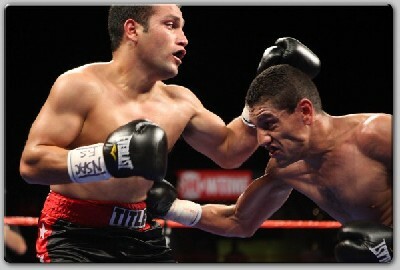 The winners of each semifinal will clash in the final in 2011 with the losing fighters competing in a consolation fight. 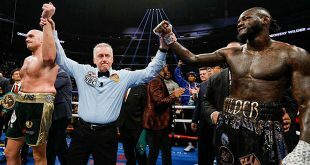 Farhood then interviewed his fellow Showtime analyst Antonio Tarver, who announced he would be returning to the ring to fight in the heavyweight division after a year-and-a-half layoff. Friday’s fights will re-air on SHO 2 on Tuesday, Sept. 21 at 10 p.m. ET/PT (delayed on the west coast). The fights will be available On Demand from Sept. 20 until Oct. 3. Boxing returns to Showtime on Oct. 1 when Tim Coleman (17-1-1, 4 KOs) faces Patrick Lopez (20-2, 12 KOs) in a 12-round welterweight main event from the Chumash Casino Resort in Santa Ynez, Calif., at a new time of 11:45 p.m. ET/PT (delayed on the West Coast). In the co-feature, Archie Ray Marquez (9-0, 6 KOs) battles Juan Santiago (13-4-1, 8 KOs ) in an eight-round lightweight affair. On Nov. 6, undefeated Juan Manuel Lopez (29-0, 26 KOs) and Rafael Marquez (39-5, 35 KOs) face off for the WBO featherweight title on Showtime Championship Boxing (10 p.m. ET/PT) from the MGM Grand Garden Arena in Las Vegas , Nev. In a special Showtime Pay Per View event, World Boxing Council 175-pound titleholder Jean Pascal (26-1, 16 KOs) meets former world light heavyweight and middleweight champion Bernard Hopkins (51-5-1, 32 KOs ) for the WBC light heavyweight title on Dec. 18. Showtime Sports will produce and distribute the fight, and utilize its own announcers. The PPV event will begin at 9 p.m. ET/PT. It is promoted by Golden Boy Promotions.